Rob Hubbard (born 1956) is a British music composer; most notably for several microcomputers of the 1980s, and especially the C64. He is married with no children. Hubbard was born in Kingston upon Hull in 1956, although he has never publicly revealed his birth date. He started playing music at age seven. At school, he played in bands and later went to music college. His early employment saw him as a musician, playing in bands, working in clubs, as well as in music arrangement and music transcription. Being interested in the development of computers in music, Hubbard taught himself to programme 6510 Assembly Language in 1983. The SID has similarities to early analogue synths and this was something that Hubbard knew very well; the concepts of Pulse Width Modulation (PWM), ring modulation and Low Frequency Oscillation (LFO) were things that he understood. This allowed him to write some educational music software as his first commercial product. Following this he wrote a video game which was never published as the company went bankrupt. Initially, Hubbard sent a flyer to companies offering his services. After submitting work to Gremlin Graphics, he was hired to compose and program the music for Thing on a Spring. This was followed by the music for Mastertronic's Action Biker. At the start of the computer music revolution, Hubbard admitted that “Back then I thought that this computer stuff was a passing trend that would last a year or two. “ After he completed a couple of games he started getting lots of work. His relationships with other computer composers developed by sending demos and using Compunet. Hubbard continued to operate as a freelance artist, as companies could not afford to employ him in-house. Although using a standard program format for the routine, Hubbard changed his music driver code fairly often to either add or delete some features. He was conscious that the code had to be as quick as possible and would optimize it for either space or processor speed. One the strengths of his code enabled the compositions to sound as if there were more than three channels used. He confessed this was simply achieved by multiplexing the three channels, “If the lead line has two beats rest, put a fill or some effect in there.” This was evident in the tune for The Last V8. Other techniques were based on what could be done on every VBlank interrupt, such as creating warbling chord effects. Later on, his code was adapted to play samples. Hubbard believed that his strength was always in arrangement, melody and harmony. While writing the music for International Karate, he started exploring pentatonic arrangements in B flat minor over different bass notes: B flat, D flat, G flat and A flat. The middle section of the tune went into F at double tempo to liven things up. Hubbard’s favourite SID tunes are Kentilla, WAR and Sanxion. The loader music for Sanxion, inspired by Jean Michel Jarre’s Zoolook, was re-worked into a piece titled “Thalamusic” using authentic Fairlight samples, performed on a Yamaha CX5M, linked up to an Akai CS900 linked up to a Digital Reverb and Yamaha RX15 Drum Machine and recorded on a four-track. It is also one of the most popular among fans and was distributed free on a cover tape by ZZap!64. Sam Fox Strip Poker was admittedly his worst; resorting to the use of an alias, John York. Monty on the Run, based upon Devils’ Galop by Charles Williams, utilised the feature of pitch bending which was new to the driver code. Knucklebusters featured his longest piece of music, at 17 minutes. Hubbard confesses that Kentilla and Delta were his most complicated. Delta was based on a minimalist composition technique inspired by Koyaanisqatsi by Philip Glass. It required some custom code to the driver and was tedious to debug, taking 2 weeks in total to complete. 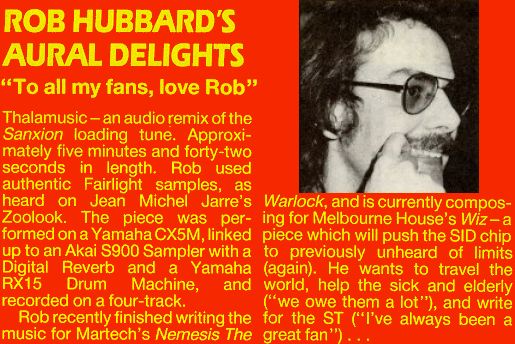 During 1987 he was approached by a major record producer who wanted him to record a single after the producer’s main mixing engineer had heard Hubbard’s tunes on the C64. Hubbard recalls “It was very scary meeting this guy and talking to him and thinking about the possibility of becoming a famous recording artist.” Ultimately the legal and copyright technicalities prevented it from happening. Hubbard started working for EAA in 1987, and from his perspective he believed that EA was making by far the most interesting products and he was eager to learn. One of his most famous SID tunes is the music featured in the loading sequence of the game Skate or Die, which features samples of electric guitar. Playback of samples was facilitated by exploiting a flaw in the SID: altering the volume register produced an audible click. Thus altering this register thousands of times per second allowed for a crude form of sample playback. Hubbard remained convinced that samples could be played on a static screen but never on the game. By the end of his time with the SID, his driver code could play 2 samples plus a SID tune, but it was never used in a game. 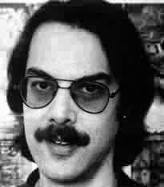 In early 1988 he left Newcastle for good to work for EA in America as a composer. He claims that he always wanted to go to the US and was really attracted by the high technology of Silicon Valley. After the C64 period he wrote some soundtracks for PC games and Sega Mega Drive. He was the first person devoted to sound and music at EA, and did everything from low-level programming to composing. He became Audio Technical Director, a more administrative job, involving deciding which technologies to use in the games, and which to develop further. As Director of Audio he became responsible for managing and scheduling resources across various projects, managing people, fire-fighting, mentoring, looking for new technology, and evangelising. Hubbard left EA in 2002 and returned to England, mainly for personal and family reasons. He has recently resumed playing in a band, and has even revisited his past game music work in concert. Recent composition jobs have included music for mobile phone games. He also aspires to get into playing again and get established in Europe. This is current known list of music written by Hubbard for the C64. Game Killer Robtek May 1986 remix of "Human Race"
Mega Apocalypse Martech Unknown 1987 Re-arrangement of "Crazy Comets"
Goldrunner Microdeal Unknown 1987 same song as "Human Race"
This page was last modified on 29 October 2018, at 09:53.